It's a new year and another new hair style for this actress. Adding to her ever-changing hair portfolio, Zendaya got bangs and a new shoulder-length cut that might just be her best look yet. The 19-year-old star is constantly changing up her hairstyle, but I can't help but hope that this choppy 'do is here to stay for a while. Braids, effortless waves, natural curls — you name it and Zendaya has probably worn it. She's got an incredible way of keeping her look fresh and always changing things up while looking completely stunning at all times, but this is by far her most sophisticated look to date. 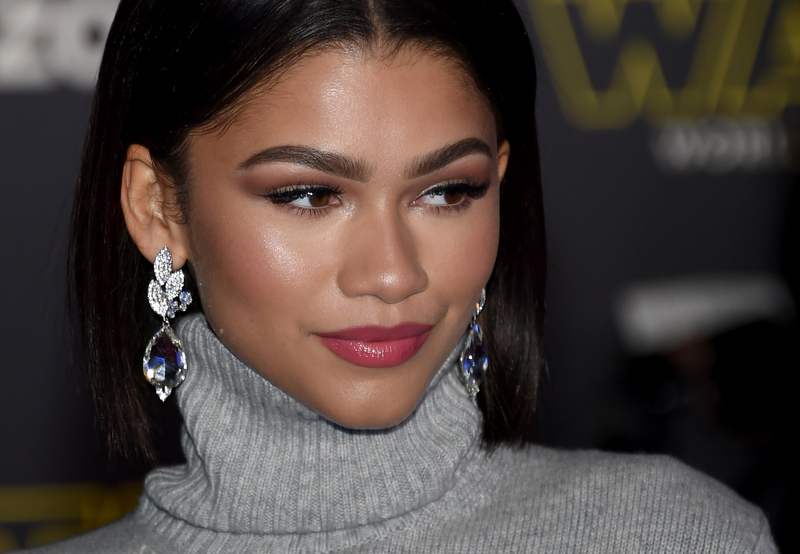 According to Vogue, Zendaya debuted her shaggy 'do at a Los Angeles party where the look fit in perfectly with the black-tie attire. She might only be 19, but the first celebrity ambassador for CHI clearly knows a thing or two about hair. Her newly chopped shoulder-length locks were kept wavy and disheveled to perfection while her bangs followed suit. The piecey bangs are just the right length to still show off her on-fleek brows while maintaining a fun and flirty vibe. Add some fabulous winged eyeliner and bronzed skin to the mix, and you have the ultimate recipe for style success. Let's hope this look sticks around for a while! This star's best accessory is her hair. She's tried out almost every style you can think of, and somehow she manages to pull each one off with ease. From high fashion looks to quirky 'dos, she's constantly surprising the world with her hair. She's rocked short hair before, but it was completely the opposite of her latest look. Who says simple can't be glamorous? She let it all hang out with her pin-straight locks at the American Music Awards. Her slicked back looks are some of my favorites, and this modern top knot was no exception. She rocked cornrows to New York Fashion Week, and looked absolutely stunning. She let her curls come out to play at the release party of the Zendaya Barbie. ...but from the back there's a Rapunzel-esque braid. Finger waves looks fabulous on the star. She surprised everyone when she showed up to the BET Awards with a mod wig. Her long Met Gala waves were one of my all-time favorite Zendaya looks. Zendaya's Oscars hair caused a bit of controversy, but she stayed true to her fabulous personal style and looked incredible.